You can be anywhere in the UK, because although our prestigious offices are near Lichfield, our systems and processes mean you can work from your home office anywhere in the UK. A highly competitive self-employed package will be offered to the successful candidate. Follow this link to our to Careers page to find out more. 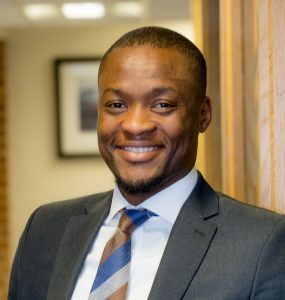 Congratulations to Financial Adviser, Yomi Bashorun who has qualified to appear in the 2019 Guide To The UK’s Top Rated Advisers. This will appear nationally in print in the Times on 23rd February. The Guide features the best Financial Advisers in the UK based on client reviews and passing VouchedFor’s checks. VouchedFor is one of the UK’s leading financial advisers search sites. All Advisers featured in the guide will be able to use the term ‘Top Rated 2019’ on their VouchedFor profile. VouchedFor says that this guide, will involve more checks than any other guide, adviser directory or industry body and will contain more information about each qualifying adviser. Yomi is a valued member of our team of Financial Advisers who provide financial advice local to Sutton Coldfield and throughout the wider Midlands area. He joined our firm in 2017, and was already a qualified Financial Adviser with many years of experience in the financial services sector. Yomi became a father in May last year and he is currently studying for his AF7 qualification on Advanced Pension Planning. We are absolutely delighted that Yomi has qualified to appear in the Top Rated Advisers Guide 2019. Well done, Yomi! Last month we held a very special event. We held a Buddy Bag Brigade just for our team. 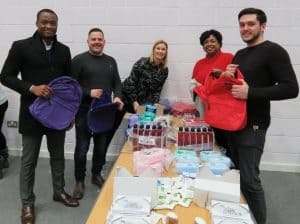 If you don’t know what a Buddy Bag Brigade is, it is an organised bag pack were between 180 and 200 back-packs are assembled for children who find themselves in emergency care. And, you can get involved too as our charity, Buddy Bag Foundation, hold bag-packs every month and they always need the help of willing volunteers. 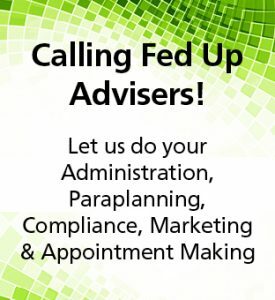 Our team of Financial Advisers who give financial advice near Sutton Coldfield and surrounding areas, and all our support staff have done this once before exclusively for Four Oaks Financial Services. But such was the response that members of our team have also helped out on many other occasions individually, so we have almost got this down to a fine art! In a little over 2 hours we were able to pack all the toiletries, underwear, pyjamas, cuddly toys, photo frames and books. There was a delay when a delivery of pyjamas didn’t arrive. We gave people the option to go home, but everyone stayed, such is our team-spirit. Following the bag-pack, two of our team even took a boot full of bags to a women’s refuge quite a few miles away. Have you used your ISA allowance for this tax-year? If you are not sure, please ask your Financial Adviser as quickly as possible. You have until 5th April 2019 to use your allowance or lose it, as the allowance cannot be carried over. This also applies to Junior ISAs for children under the age of 18. The allowance for adults is £20,000 and £4,260 for children. ISAs are tax free savings, so generally speaking they are an excellent way to save, especially as interest rates for traditional savings accounts are so low and likely to remain low for the foreseeable future. Our Advisers, who provide local financial advice in Sutton Coldfield and wider area, will give advice that is appropriate to your individual circumstances and they will be able to help you decide whether a Cash ISA, Stocks & Shares ISA or a combination of both kinds is what you need. All we ask is that you give us time. 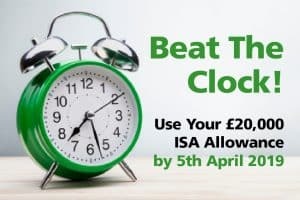 Arranging ISAs is straight-forward but we have to ensure that your ISA is set up and the money you are investing has arrived in the ISA account by 5th April 2019.